Sometimes, when you’re doing family history research, you get more than just a list of names, dates, and places, and you find out “what happened.” For me, the facts themselves can be fascinating, but it’s even better when you can find the story behind the facts. You hope to find out that some ancestor was a good person with a good life, but sometimes you find out they weren’t so great. Sometimes, you find someone who had highs and lows. 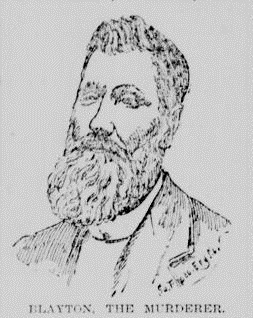 Enter John Henry Blayton, who lived from 1827 until the early 1900s. The information below comes from a variety of sources. The facts come from various civil and military records and dozens of contemporary newspaper articles. The story behind the facts comes from the newspaper articles and family stories shared with me by one of John’s direct descendants. John’s father, also named John Blayton, was my great, great, great, great-grandfather, on my father’s mother’s side of the family. That’s the branch of the family tree that has been in Virginia since the early colonial days. The elder John was, like so many of my Virginia ancestors, a slave owner. He owned anywhere from 3-6 slaves. He lived in Charles City County, between Richmond and Jamestown. He might be the same John Blayton who served during the War of 1812. John senior’s parents were also Virginia slave owners. His father, William, fought during the American Revolution. John’s mother, Maria Saunders, had a similar story. She, too, was the child of Virginia slave owners. Her father, Archer Dennis Saunders, also fought during the Revolution. In a move that was unusual for mixed-race children, John ensured that their kids got an education. One or more of them went to the Hampton Institute. Their youngest son, Bob, became good friends with Booker T. Washington at Hampton, even serving as the best man at Washington’s wedding. John enlisted in the 3rd Virginia Cavalry Regiment when the Civil War broke out. He held the rank of private, in Company F, the New Kent Cavalry. He had a reputation for being fearless in battle. The regiment participated in many of the war’s major engagements, including Gettysburg. April 9, 1865: The 3rd Virginia Cavalry surrendered to Union troops, along with the rest of the Army of Northern Virginia under Robert E. Lee. After the war, John returned to his de facto family. The 1880 US Census still found John and Susan living together with some of their children. By this time, John and Susan had been together for at least 36 years. Either John decided he wanted white children or he was pressured into having white children. He found a young white woman to marry him, but first, he took care of his de facto family, deeding his property over to them. Susan and their kids had a place to live for the rest of their lives. At least one of their grandsons became a millionaire. April 18, 1882: John married Virginia Esther Jones. She was 25. John was 55 (or 52, depending on the source). Newspaper articles described Virginia as “a rather pretty woman.” They lived in New Kent County. May 4, 1883: Virginia made out her will, leaving everything to her husband and naming him as her executor. John and Virginia never had any children. The plan to have white children didn’t work out. 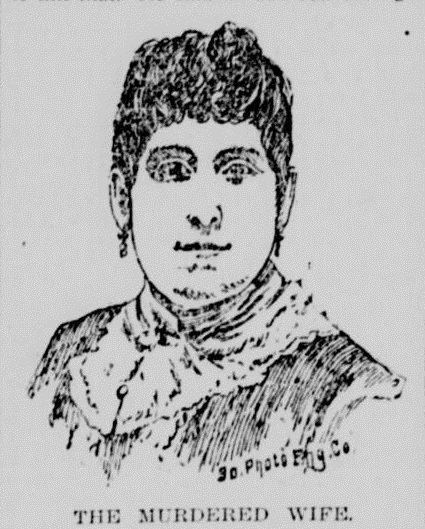 May 17, 1892: John and Virginia moved to Richmond, bringing Virginia’s niece, Lula Crump, with them. John ran a grocery store out of their house. They also took in George Bell, who was about Virginia’s age or a little younger. Bell worked for them as a grocer. He had left his wife and child in Washington, DC, because, he said, his wife had been unfaithful to him. John and Virginia often played cards with their boarders and neighbors. John and Virginia normally played as partners, but one time Virginia wanted a change of pace and said she wanted to partner with someone else. John became furious, and that was the end of the card-playing. February 6, 1894: Bell bought out the grocery business from John. April (or so), 1894: According to John, he had complained to Virginia before that she and Bell had gotten too chummy, like sitting too close together. He sometimes found Bell sitting on Virginia’s lap. Virginia told him it was “only fun” and he told her it was “too much fun.” She kept telling him he was crazy. It was also around this time that Elmore Christian caught Virginia and Bell holding hands and standing very close together. She said Virginia hit her with a broomstick and washboard and threatened to have her arrested if she told anyone what she saw. Elmore was then a teenager; she had been raised by Virginia, and she had worked for Virginia. A few weeks before the murder, a police officer came to John and Virginia’s house and spoke to Virginia. John became furious. I don’t have any info about the purpose or outcome of the officer’s visit. April 29, 1894: John decided to visit New Kent County, and brought Virginia with him. They visited Lula’s mother. May 1, 1894: Virginia returned to Richmond. May 6, 1894: John visited the home of his brother James. James’s father-in-law, Richard Eggleston, said John was behaving strangely and claiming that someone wanted to kill him. May 7, 1894: John came back to Richmond, telling Virginia that people were trying to kill him. He said he’d spend the nights running away from would-be killers and ghosts. May 10, 1894: John stayed at an almshouse overnight, claiming that he hated to see his wife doing all the work. He showed up there in the evening, sat around looking “disturbed over something,” then went to bed. He left the next morning, skipping the breakfast offered by the almshouse. John returned home just as Virginia was asking his sister to help search for him. He didn’t offer any explanations. Around this time, possibly before or after the night in the boarding house, Anthony T. Mallet (around age 40) warned Bell that he should go away and leave Virginia alone. Mallet was a neighbor and friend of the family who visited often. Mallet also warned John that he should keep his eyes open because of a possibly improper relationship between Bell and Virginia. Once Bell found out that Mallet had warned John, Bell threatened violence against Mallet. One evening, John told Virginia he was going out for a walk. He sneaked back and peeked in through the windows. The news articles didn’t give details on what he saw, but whatever it was, it convinced him that there was an improper relationship between Virginia and Bell. Night of May 16, 1894: John stayed up all night with a pistol, convinced that someone was trying to kill him. May 17, 1894: At about 10 o’clock in the morning, John confronted his wife again. He told her he’d go away for a while because she didn’t like him, and she agreed she liked someone else better. She told him to mind his own business and she’d do as she chose, and told him to stay away as long as he wanted. She threatened that Bell would knock him around if he made any trouble. John flew into a rage and shot her. Mallet heard the shot and screams and came running. He found them in the upstairs bedroom as John shot his wife again. Mallet went to stop John, who fired further shots. Mallet wasn’t hit, and he managed to carry Virginia downstairs. John tried to kill himself by chopping at his face with a hatchet, a knife, or both, depending on which report you read, but he wasn’t successful. News articles disagree on the extent of his self-inflicted injuries, but in any event they weren’t fatal. Others arrived, and they managed to restrain John. Virginia died within minutes. The police and a doctor arrived, but not in time. John admitted to killing Virginia. Reports differ on how many times Virginia was shot, anywhere from two to five times. John was taken to the almshouse with a police officer to stand guard. Doctors there said he suffered from “temporary flights of insanity,” randomly crying or talking incoherently. He told attendants that he was sometimes out of his mind and “not well balanced” at any time. May 18, 1894: John’s brother James visited him briefly at the almshouse. Meanwhile, throngs of nosy people were crowding around John’s house to gaze at the crime scene. May 30, 1894: Richmond held a parade and reunion celebrating Confederate veterans, almost 30 years after the war had ended. Around 3,500 veterans were present. John was unable to participate, of course. May 31, 1894: John was brought to Police Court with the lawyers who were defending him, Richmond T. Lacy and D.C. Richardson. A Judge Critchfield was presiding. John’s lawyers said he “desired to waive examination and asked that the case be certified at once to the grand jury.” A few witnesses were called, including the police officers who went on scene, Anthony Mallet, and Elmore Christian. July 7, 1894: John came up before a competency hearing. A doctor who had interviewed John said he was insane and suffering from Bright’s Disease, which the doctor said could have aggravated the insanity. John’s brother James added to the testimony that John was “a crazy man” who thought people were trying to kill him. The jury took five minutes to reach its decision. John was “adjudged insane” and sent to the “Insane Hospital at Williamsburg.” John’s oldest son by Susan Allen, George Washington Allen (now in his forties), held a power of attorney for acting on John’s behalf. July 23, 1894: Virginia’s will went to probate. Her estate was worth about $1000. That’s equivalent to about $25,000 today. John had been designated as the executor of Virginia’s estate, but he was now ineligible to serve in that role. September 24, 1894: John’s former home was partially damaged by fire. The news articles reporting it didn’t name a cause, and identified it only as John’s former home. Fire fighters extinguished the flames before the house burned down. In the 1900 US Census, John is listed among the inmates at Eastern State Hospital, a mental health hospital. Presumably, John spent the rest of his life there. Susan Allen also shows up in the 1900 US Census, living with her youngest son Robert and Robert’s wife Elviry and their four kids. Susan would die a few years later. Her family lived on. All of today’s descendants of John H. Blayton are also descendants of Susan Allen.